Note: Everybody Gardens videographer Jess Levo will be chronicling her adventures as a first-time gardener under the guidance of Doug Oster this year. It all started with Doug Oster offering me a birdfeeder and birdseed. Now I’m officially a crazy bird lady. Just about every Monday, Doug and I shoot the week’s “In the Garden” video. This particular week, he told me, was going to be about birds. I had no idea what birds had to do with gardening, but I quickly learned. Before we finished shooting for the morning, Doug and I each set up our cameras pointed at the freshly filled birdfeeders. We hit record and went inside to wait while the birds ate. After about 15 minutes, we brought our cameras in and reviewed the footage. I couldn’t believe what I was watching. So many different birds came to the feeders to eat. It was exciting, and we had some great shots for our episode. Walking out, Doug offered me a squirrel-proof feeder and a bag of Cole’s black oil sunflower seeds. I shrugged and figured I’d take it. Why not? 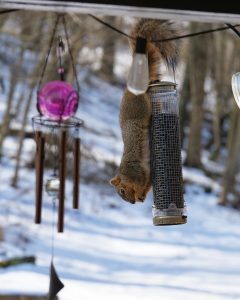 I set up the feeder the next day and filled it with the seeds. Remembering what Doug had said about staging, I placed it at the end of our back porch near the trees and waited. Nothing … for days! The next day, I was sitting on my couch editing, and I heard a chirp. 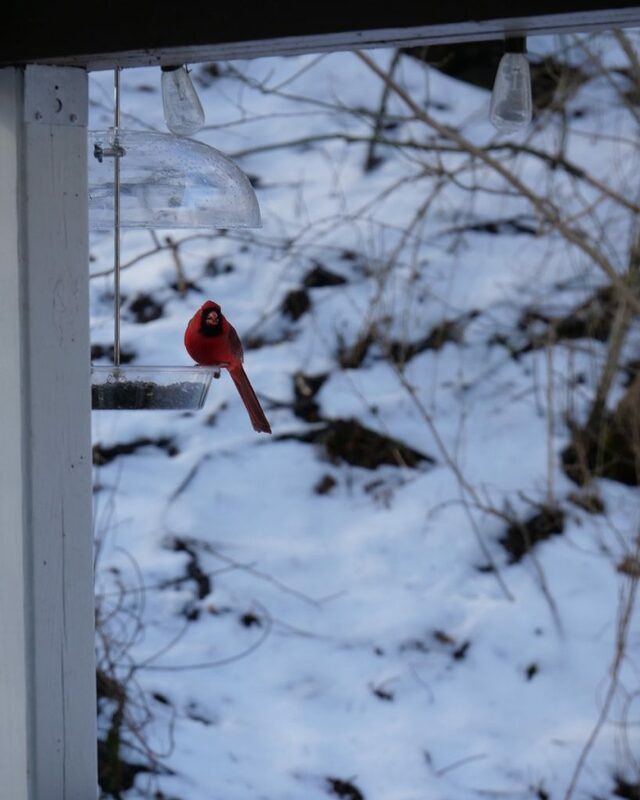 I ran to the window and sure enough, there sat a bright red cardinal. I was so excited! Over that week, every morning I’d sip on my coffee and watch the birds come. Every day it seemed like a new species showed. 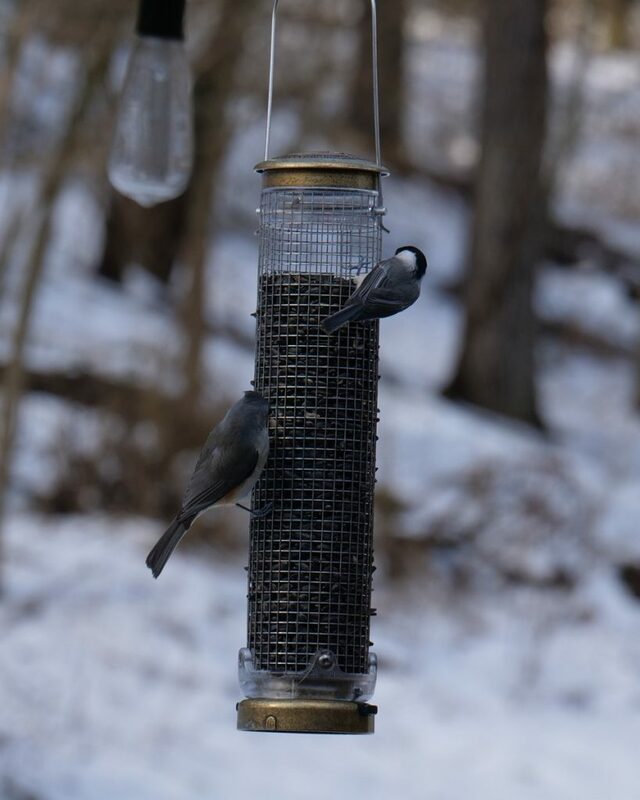 First it was the cardinal couple, then came the black-capped chickadees, the tufted titmouse, mourning doves and sparrows. One morning, I leapt out of bed when I thought a heard a woodpecker. My husband laughed, as I ran to the feeder. (He officially thinks I’m crazy.) Woodpeckers have joined my group of birds along with finches, nuthatches and different types of sparrows. I told Doug all about my birds, and he offered me a second feeder. I was thrilled. My obsession was just beginning. Since then, I’ve bought two more kinds of birdseed, a flamingo-shaped feeder (I’ve got a thing for flamingos), and started researching how I can make my own feeders and birdbaths. I even have a Pinterest board dedicated to my birds. My favorite part has to be after I fill up the feeders. I shut the back door and stare out the window with my coffee and watch as the birds descend down the hill, through the woods to my various feeders. It’s fun to see what birds show up that day, which ones are brave enough to fly in first, who goes to what feeder, if any new ones arrive, etc. My cats love to watch, too! I’m considering placing a feeder in the ground in front of our bay window to make viewing a little easier on the cats. They’ll be entertained for hours. I told my best friend about my bird obsession, and now she’s joined in the fun. She sent me pictures of her new feeder and seeds. Of course, I’m cheering her on and can’t wait until the birds show up to her feeder. I’m not sure why I love feeding and watching the birds so much. Maybe it’s because I feel like I’m helping some of God’s creatures. Or maybe it’s because I know it will benefit my very first garden. Maybe it’s just relaxing to watch them every morning. Regardless, I don’t plan on stopping anytime soon.